March 27th is National Paella Day. 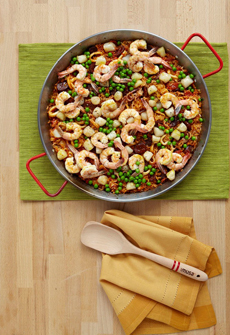 Many people think that paella is a complex, time-consuming dish—and classic recipes can be. But you can make this simplified version from Good Eggs easily on any weeknight. After 20 minutes of prep time, 20 mins active time plus 40 minutes simmer time. 1. PLACE a large pan over medium heat (a skillet or roasting pan will do). Add in 2-3 Tbsp of olive oil, and add the onions. Crush the saffron threads between your fingers and sprinkle over the onions. Cook, stirring occasionally until softened. Add in the garlic and cook for another minute. 2. ADD the rice, broth, lemon juice and zest, and stir until well combined. Turn the heat to high and bring liquid the to a boil. Cover, turn the heat to low, and simmer for 25 minutes. 3. ADD the peas and 1 teaspoon salt, and stir to blend. Cover and simmer another 10 minutes. Taste and season with more salt if desired. 4. PLACE the shrimp in an even layer on top of the mixture. Don’t stir, but cover and cook another 10 minutes. 5. REMOVE the cover and turn the heat to medium. Continue to cook without stirring until the shrimp are fully cooked. Watch carefully to avoid burning the bottom, although a golden-brown crunchy, crusty rice bottom crust—called soccorat—is ideal. *Save the parsley stems: They add excellent flavor to soups and stews. Parsley stems also prevent artichokes from browning. Just drop them in a bowl of water with the cut artichokes. You can store the stems in the freezer. 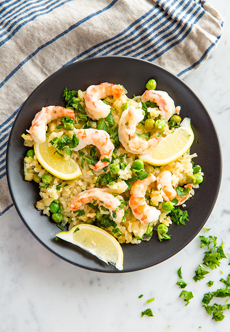 If you want a creamy risotto or paella, you need to use Arborio rice. 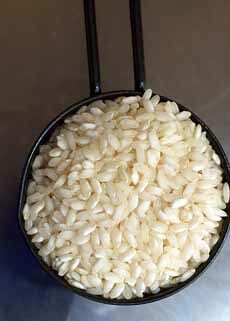 This medium-length, round-grained rice is named after the town of Arborio, in Italy’s Po Valley, where it is grown. The grains have a more beige color with a characteristic white dot at the center of the grain. You don’t need a special paella pan like this one; but here’s why it helps—plus other uses for it (photo courtesy Imusa). Arborio rice: more beige, and much more creamy when cooked (photo courtesy A Sassy Radish). Developed to create creamy risottos, Arborio rice develops its creamy texture around a chewy center (the creaminess comes from a high starch content). It has an exceptional ability to absorb flavors. Arborio is a cultivar of japonica rice, the same variety that produces the other “sticky rices” including mochi and sweet rice. Pricier, creamier rices developed by Italians for their beloved risotto are canaroli rice and vialone nano. Rice pudding fans: These three rice varieties make creamier rice pudding, too. Here are the different types of rice.